1. 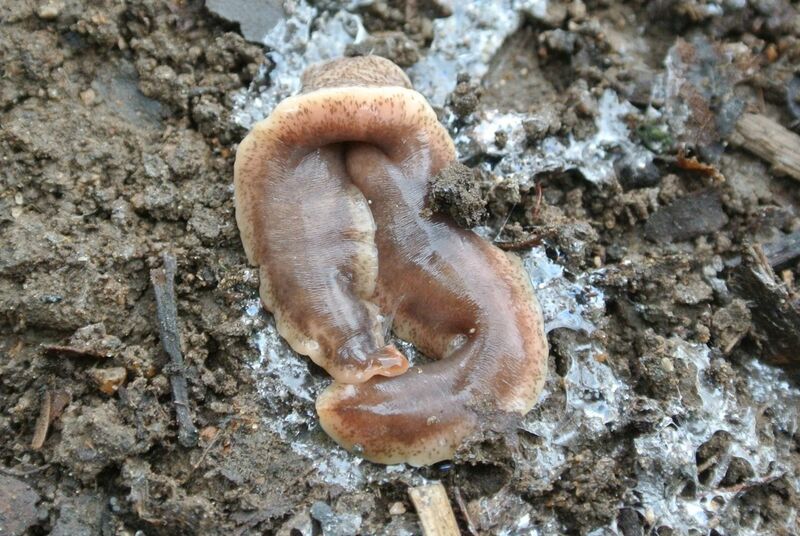 Do you have New Zealand Flatworm on your plot at present? 2. Have you had New Zealand Flatworm on you plot historically? 3. Would you be happy for someone from Aberdeen University to visit your plot and record presence and abundance of NZ Flatworm, soil pH, take a small soil sample and record earthworm numbers? In addition they would ideally like to talk to you or alternatively get you to fill in a questionnaire to enable them to gauge the scale of the problem and find out more about your experience of NZ Flatworm. This would be done mid-March- April at a time convenient to you. If you wish to participate please contact Annie as soon as possible. It would be helpful if you would be good enough to let me know if you decide to participate. Thanks go to Bruce Taylor for alerting me to this study. Aberdeen University has announced it has researchers taking part in a national survey of the New Zealand Flatworm‘s spread and its effects on our gardens, plots and fields. 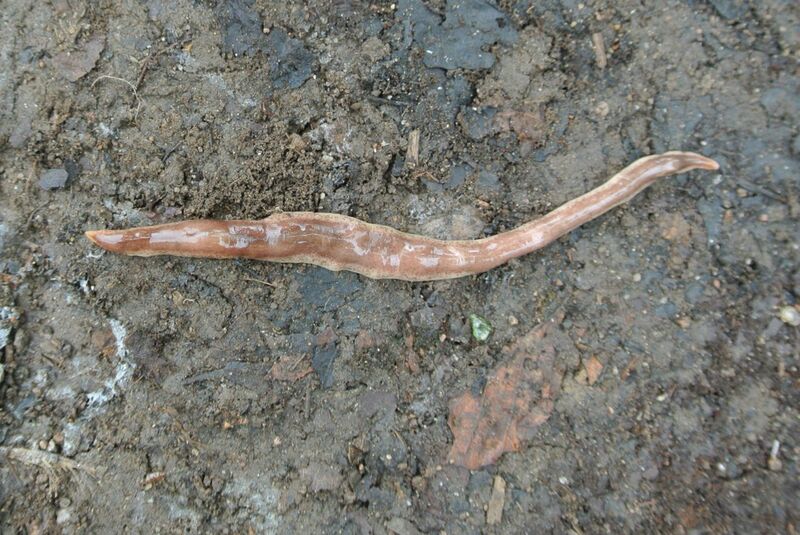 As we know the Flatworms kill our native earthworms, but the university site contains some truly gruesome details about how they go about their murdersome business and how difficult they are to eradicate once they get established. It appears that the flatworms can reduce to 10% of their body weight for up to a year as they await another earthworm dinner. Perhaps the weight-loss industry ought to be sponsoring this survey! Stuart recently circulated an email reminding us that New Zealand flatworms have been resident on our site for several years now. 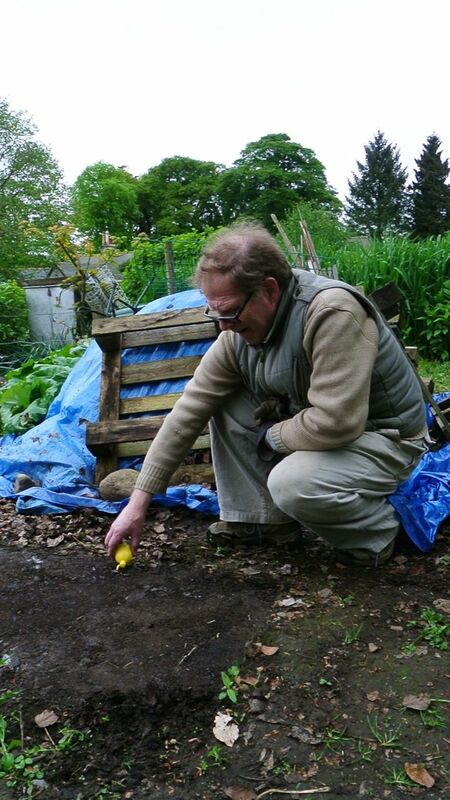 If you are lucky enough not to have come across any on your plot, you want to look out for them – they are a murderous bunch and live almost exclusively on our native earthworms. 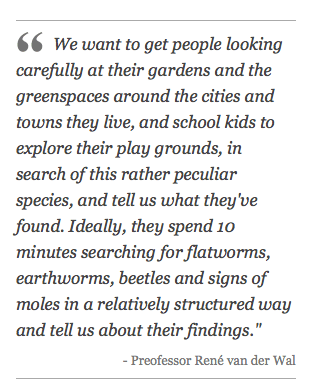 Some of our plotters report finding no earthworms in their soil for the last four years or more and NZ flatworms (Arthurdendyus triangulates) are the obvious suspects. They kill their smaller earthworm prey in the most unpleasant way – covering them in mucus to part-digest them, then sucking up their remains. They have a voracious appetite and will quickly decimate local earthworm communities if left uncontrolled. They are not a problem limited to our area. Researchers from Scottish Natural Heritage indicate they are present across much of Scotland as this Advice Note and Distribution Map shows. Early reports from the 1960s, when they first appeared in the UK, warned of the possible elimination of our earthworm populations, but more recently commentators have suggested that with help our earthworms may be able to come to terms with the interlopers. Research is on-going at The James Hutton Institute and sightings should be reported to Dr Brian Boag via the above link. Inspect any pots or containers of bought or swapped plants before planting to prevent new infestations. Look under flat stones or wood etc. as the flatworms retreat to these locations during the heat of the day. 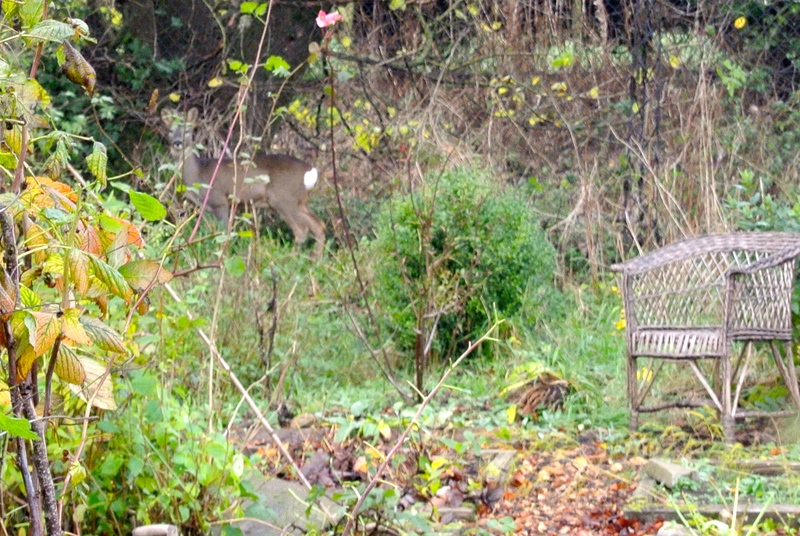 Lay such traps, or peg out sacking to find if they are present. Kill any flatworms found by grinding between stones, completely squashing, dropping them into very salty water or spraying them with lemon juice. Ground and Rove Beetles are reported to prey on the adults. Add farmyard manure to help introduce more earthworms. Pat Wilson circulated a recent Factsheet – see Stuart’s email. New Zealand flatworms – should we worry?